NYFA Polar Elite 10U Takes 2nd Place! The 10u NYFA Polar Elite took home second place in the WPA Class C State Championship in Chambersburg this weekend. They Started off Saturday by going 1-1 in pool play, defeating the Lady Renegades 3-0 then losing to the Sandlot Sisters 8-1 which gave them the 2nd spot in pool B going into the championship bracket on Sunday. In the first pool play game against the Lady Renegades, a series of walks in the first inning put Emma Shope, Hannah Keith and Mackenzie Lilley on the bases, then a fourth walk of Kate Willow sent Shope home for the first run. Then in the bottom of the third, Avery Yoder, Keith and Willow are all walked to load the bases, when Izzy Hobby hits hard ground ball to double and send both Yoder and Keith home. Solid pitching by Sammy Magee throughout the entire game kept the Lady Renegades off the board. In the second pool play game, the Polar Elite took a tough loss against the Sandlot Sisters with only 1 run being scored when Savanna Byers singled on a hard ground ball to 3rd base. Byers then stole second and was able to score when Keith singled on a line drive to second. Unfortunately, this was the only scoring offense they were able to put together in this game. Sunday morning, the Polar Elite came ready to play when they faced off in the first elimination game against the Pheonix Warriors. In the first inning, Hobby was hit by a pitch and then stole second, which led to her scoring when Byers hit a line drive to left field. Magee then singled on a line drive to center, which sent Byers to second. Byers and Magee both advanced a base, which led to Byers scoring on a tag up at 3rd when Kylie Kerns hit a fly to right field. On the next play, Magee stole 3rd, putting her in position to score when Shope singled on a ball to second base. Up next, Sabrina Paulin was walked, sending Shope over to second. Keith then stepped to the plate and was able to get Shope home and send Paulin to 3rd. Yoder then stepped to the plate and was able to hit a ball to the short stop which allowed Paulin to score the fifth and final run of the inning as Polar Elite hit the league allowed run limit. Later in the 4th inning, Polar Elite was able to put four more on the board when Yoder walked, then stole second and then advanced to 3rd on a single by Lilley. Willow then got on when the opposing pitcher missed a pop up, causing bases to be loaded when Hobby hit a three RBI single that sent Yoder, Lilley and Willow home. A single by Byers then advanced Hobby to 3rd and Kerns was able to hit Hobby home for the final run of the inning. The final run of the game was scored when Paulin singled and was able to steal both 2nd and 3rd, which allowed her to score when Keith grounded out to the shortstop. This great game of offense allowed the Polar Elite to advance to the next round with a 10-6 win. A tough rematch against Lady Renegades supplied the win needed for Polar Elite to advance to the championship game in a 1-0 defeat. Magee only allowed 2 hits by the Lady Renegades while on the mound, allowing the 1 run scored due to a few walks that led to Byers being on 3rd base when Kerns hit a grounder to the short stop to be enough to take the Polar Elite to the championship game. By the time the championship game begin around 3pm against Nita Rumble, a team that had held opponents to 1 total run all weekend, temperatures had reached the high 90's and the NYFA girls were hot and exhausted, yet determined to power through. Unfortunately, Nita Rumble got on the board early and only gave up 1 hit to Keith during the entire game, which led to an eventual shut out as the Nita Rumble took home the Championship with a 7-0 win. Coach Magee later stated that he was really pleased to see how the girls persevered in the first real outdoor two day tournament. All of the girls had hits during the weekend and contributed both offensively and defensively. Weekend batting leaders included Hobby (5H, 5RBI, 2R), Keith (5H, 3RBI, 1R) Byers (3H, 1RBI, 3R), Kerns (2H, 3RBI), Magee (2H, 1R), Shope (1H, 1RBI, 2R), Yoder (1H,1RBI, 2R), Paulin (1H, 2R), Willow (1H,1RBI, 1R) and Lilley (1H, 1R). Magee led the pitching with 37 SO followed by Kerns with 9, Hobby with 3 and Shope with 1. The team is comprised of girls from Dillsburg, Carlisle, Bermudian and Greencastle. Coach Magee couldn't say enough times how proud he was for the girls and how he cannot wait to see what they are able to do the rest of the season. Next weekend the girls will be playing in the Summer "C"lash in Ellicott City, MD. 10U Polar Elite Travel Team Has Formed! Practices: Formal practice schedule will begin January 1st. 10U Polar Elite Wins First Travel Tournament! 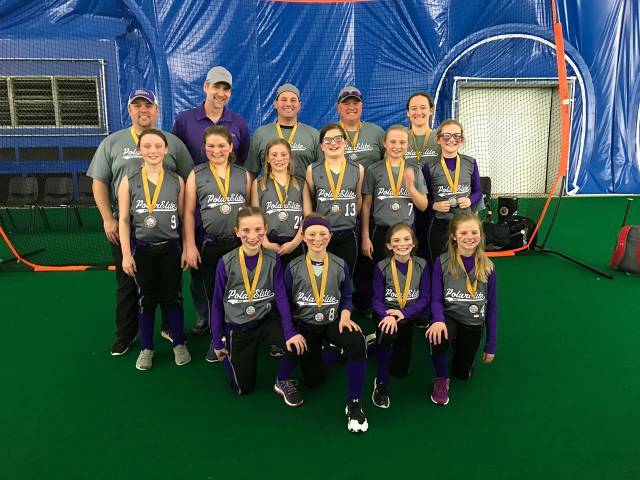 10U Polar Elite wins Spooky Nook Class C Tournament on 3/30/2018! Congratulations!